But I have an extra love for weekends, and it’s called pancakes. I know, I know, I’ve discussed this before, but I have a feeling most of you weren’t around back then, so let me reiterate. Weekday breakfasts in my world consist of an enormous cup of coffee as I start up my computer at work, followed by a bowl of cereal and milk about an hour later. And in case any of you thought that bowl of cereal was a treat of any sort, let me clarify. When I say bowl, I actually mean a cup. As in the awful little Styrofoam cups that my company expects us to drink out of. And I have a theory about my cereal that is proven correct pretty much every morning. It goes like this: basically the world somehow knows the exact second that I pour milk over my cereal, and suddenly my phone rings. And just as I manage to get the person off the phone, hoping to salvage the last bits of crispness in the aforementioned cup, my phone rings again. And it pretty much goes on like that until my cup is full of a soggy mess of cereal. And that my friends, is breakfast. On a weekday. And that’s why I have an extra little love for weekends. Honestly, it’s not always pancakes. Sometimes it’s an omelette Sometimes it’s a gourmet form of oatmeal. And often it’s pancakes. And on occasion, it’s ice cream. Don’t judge. But I digress. Let’s get back to pancakes, shall we? I’ve been experimenting with various versions of pancakes lately, and this one is among my favorites. It’s healthy and it has chocolate, need I say more? In a medium mixing bowl, stir together the cottage cheese, milk, eggs and vanilla. Stir until combined. Add the flour, baking powder, cocoa powder and splenda and mix until completely combined. Heat a frying pan over medium heat. Spray with pam or non stick baking spray. Pour the batter in heaping spoonfuls onto the hot pan. Fry until the top appears set, then flip it over and fry it until cooked through. It should be lightly browned on the outside of both sides. If you want an extra treat, sprinkle them with chocolate chips just before flipping them. Serve hot, with maple syrup, berry sauce (that’s a recipe I’ll have to post one day) or even chocolate sauce! Thanks for stopping by! 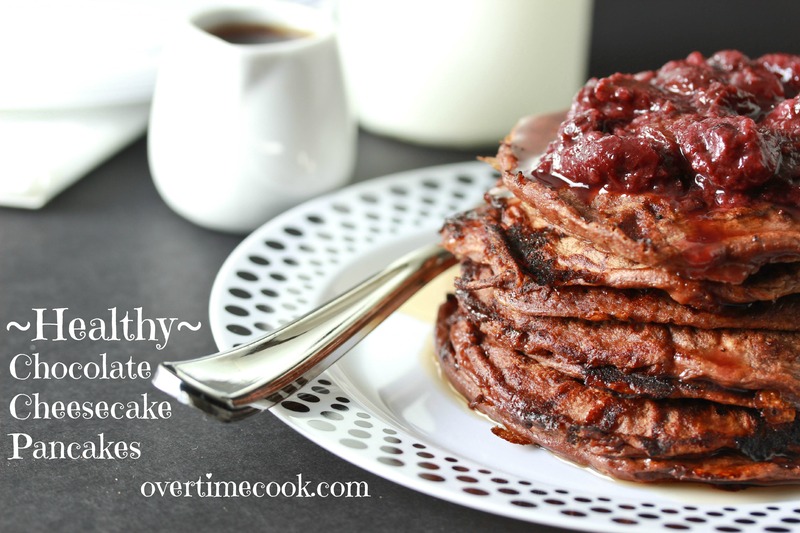 Hope you all try these delicious pancakes! -Miriam PS- do you follow me on Facebook? Pinterest? Twitter? Instagram? I love connecting with my readers, so make sure to find me! Brrakfast are sonething special. I feel quite strongly about this! They sound very rich and delectable! I appreciate the sugar free options that these pancakes provide– my daughter is a diabetic and it makes life easier when I don’t have to worry about overloading her with sugars instead of more hearty carbohydrates. Entirely agreed with you on the workday breakfasts! I do the exact same thing. Have you thought about bringing your own cup or bowl to work so you don’t have to use those disposables? I have a sweet spot for pancakes, too. I usually try to avoid them because they’re not very good for you, but this version sounds healthy — ! love it! This looks so indulgent! Have to try this healthy recipe! You’re spot on… pancakes = best part of weekends. These sound incredible! 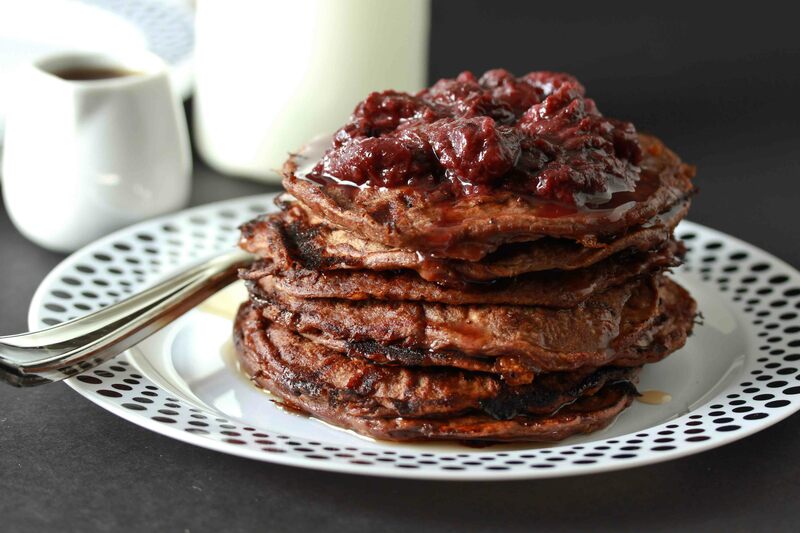 I’m always trying new pancake recipes; definitely going to give this one a go! 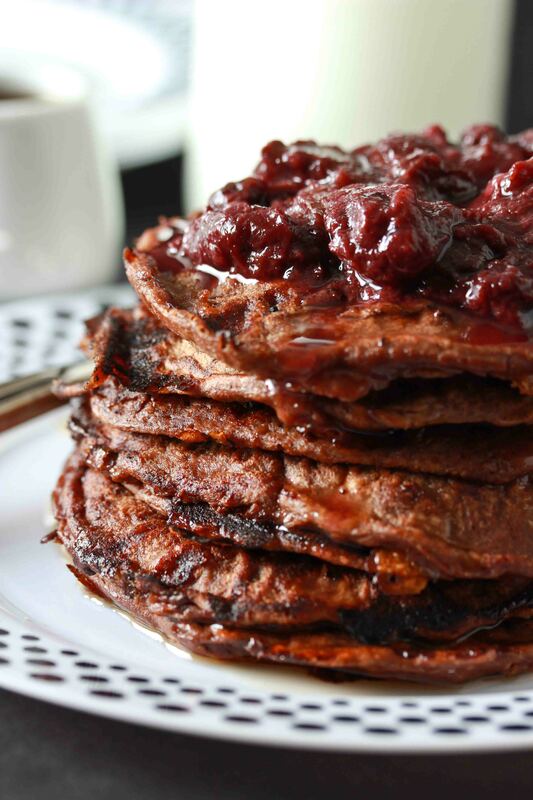 Feel exactly the same about breakfast during the week.. nothing beats pancakes on the weekend, and these look amazing! Healthy too? Dream come true! Thanks so much for posting this! You’ve taken one of my favourite breakfast foods and turned it into something even more amazing. Can’t wait to try it out! Some people like breakfast foods only at breakfast and others like breakfast for dinner. I think I would like this breakfast pancake for any meal or dessert! I made these this morning and they were delicious! As a chocolate lover, pancakes + chocolate = best ever breakfast. Thanks for this great recipe. I’m so happy to hear you enjoyed these! These look amazing!!! 2 questions – can I use a liquid sweetener (agave or Silan. – will this ruin texture ?) also, can I use reg whole wheat flour? You can play around, but all of this will affect the texture so I can’t make any guarantees without trying it. Around how many pancakes does one recipe yield? I can’t wait try it for Shavuos, just want to know how much cottage cheese to buy. Next time lower the flame.